This short horror story penned by H.P.Lovecraft, one of the best writers of the ‘fantastic’, is quite similar to the general writings of Edgar Allan Poe. The story is par excellence teaming suspense with a bit of an indirect moral which makes this story a fantastic read. The main theme however of this story is about man’s eternal search for truth & how this search often ends not to the expectation of the seeker. They were definitely not of any normal disposition although they were young & full of life. 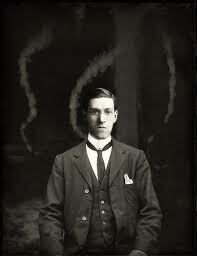 Lovecraft often uses scholarly people as characters in his texts to bring out his thoughts. These characters often are recluses who devote themselves to their study away from the daily happenings of society. St. John & the narrator in this story are also in search of a new field of study to aid them in their quest for the truth. They try every known & possible intellectual movement but, all these fields of study fail to whet their appetite or its newness or novelty was soon exhausted by them, which led them to look for another & yet another field of theory & research. Ultimately, they somehow get interested in grave robbing which was sort of the ‘philosophy of the decadents’ which was in practice at the time when this short story was penned. Certainly by this description itself, the author of the macabre sets the tone for even more gruesome happenings using suspense filled sentences as tools to aid the reader along this path of terror. The two characters in this short story namely the author himself & his companion St. John then go out on a journey to Holland to dig up the grave of a certain ‘ghoul’ who had been lying in the grave itself for five centuries. The author’s use of the term ‘ghoul’ here gives us an idea of what to expect throughout the remainder of the story. A ghoul as we know is a monster associated with graveyards and consuming human flesh, often classified as undead which signifies ‘the vampire’……yet the title of the story is ‘the Hound’…..again an ardent fan & reader of horror fiction would be aware that the legendary vampire is also able to leave its eternal tomb & change into the form of certain animals, a huge hound being one among them. The author mentions in this story that the ghoul himself was a grave robber & also a person who had robbed something rather marvelous from an ancient sepulcher. The two characters while digging for the body find around the dead skeleton’s neck an amulet made of green jade which is the stone often used in China. The amulet consisted of the figure of a sphinx with canine features or a dog like appearance. The author & St. John take away this amulet from its grave but their lives after this undergoes a dramatic change. It is also well enough to note that this is the first story of H.P.Lovecraft where the mention is made of the fictional & forbidden book called ‘Necronomicon’ penned as Lovecraft put it, by the mad Arab Abdul Alhazred. It is in this book that the author & his companion come to know about the strange properties of the amulet which disturbs them quite a bit. 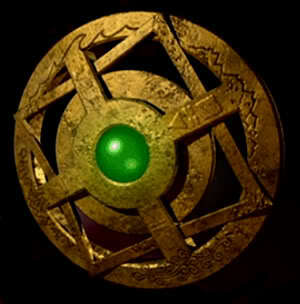 Yet they continue to preserve the amulet & even light a scented candle infront of it. The author tries at first to ignore the link between all the events from Holland uptill St. John’s death & tries to get away from the mansion. A circumstance in London however makes him realize that what was to become of his companion would be his ultimate doom as well. He tries in vain to save himself by returning the amulet back to its owner in Holland but to his misery, he is robbed of the amulet by thieves. When he returns to the grave however, he finds the amulet back with its owner who has been somehow nourished in the grave the way a vampire is nourished by drinking blood. The skeleton in the grave now has grown some flesh & is caked with blood. When it gave a deep sardonic bay like a hound, the author runs away from the wretched place like a madman. It is towards the end of the narrative that we realize that the story was a sort of suicide note of the author who wishes to end his life after the end of this tale. He at the end of the story seems to be plagued by the memory of all that had taken place which had affected him psychologically for the worse. The underlying ideology in this story is of course the never ending fight between good & evil & where must one finally draw the line. To get a little excitement in one’s life, most individuals some way or another delve into the tempting depths of evil just as the author & St. John did, but the climax finally made the reader realize which is the more safer path to choose. SPOILER: “The Hound” is one of those stories that only really works (or at least works best) if you DON’T know it’s a vampire story going in. Which is why it’s been a huge mistake for certain vampire anthologies to include it. The fact that the villain’s a vampire and not a werewolf (or something else) is the twist, and the way it’s done makes it quite eerie and freaky — if you’re not suspecting a vampire is to blame. Once you are, it ruins the story. It was an analysis for literature students who would be helped by my studies on Lovecraft.Thanks for appreciating my post and reblogging.